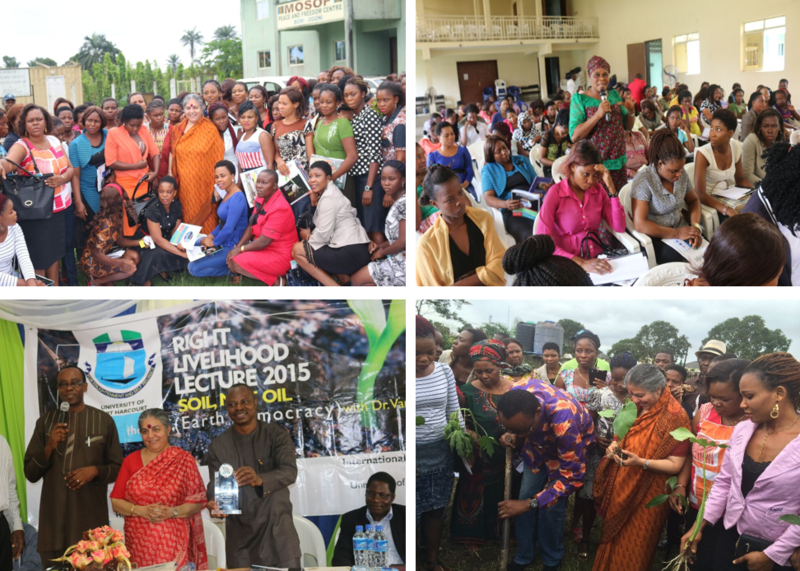 On July 23, to mark the UN International Year of the Soil and the decades long struggle against oil extraction in the Niger Delta, 1993 Right Livelihood Award Laureate, Vandana Shiva, gave a lecture at the Right Livelihood College in Port Harcourt. The event was organized in collaboration with Health of Mother Earth Foundation (HOMEF) and 2010 Right Livelihood Award Laureate, Nnimmo Bassey. The UN has chosen 2015 as the International Year of the Soil with the aim of raising awareness about the importance of soil for human life, food security, climate change adaptation and sustainable development. In the Niger Delta, oil extraction has severely contaminated the soil. A 2011 the United Nations Environment Program (UNEP) Report assessing the environment of Ogoni found that, in over 40 locations tested, the soil is polluted with hydrocarbons up to a depth of 5 metres and that all the water bodies in Ogoni land are polluted. “With oil spills occurring with a disturbing frequency of almost one a day, the soil and waters of the Niger Delta are being severely degraded, thus raising challenges for production of wholesome food,” said Nnimmo Bassey, Director of HOMEF. “Vandana Shiva’s visit is timely and she raised critical issues on the need to preserve our soils, seeds and food systems, rather than allowing them to be destroyed by the irresponsible activities of oil companies in their bid to extract resources of diminishing value. Vandana Shiva, a physicist, philosopher, feminist, activist and author, has dedicated her life to defending small farmers’ rights and the rights of people to forests, biodiversity, water, seeds and land. Her organization, Navdanya, which means “nine seeds,” has been actively involved in rejuvenating indigenous culture and knowledge, and setting up seed banks across India, training farmers in sustainable agriculture and seed sovereignty. Dr. Vandana Shiva is a world-renowned environmentalist.